While the world has been focused on the aftermath of the earthquake in Nepal, and Americans have been following events in Baltimore, there was a subtle shakeup in the diwan (royal court) of the Kingdom of Saudi Arabia. This shakeup follows a rather bold move by the new Saudi king soon after he assumed the throne in January of this year. 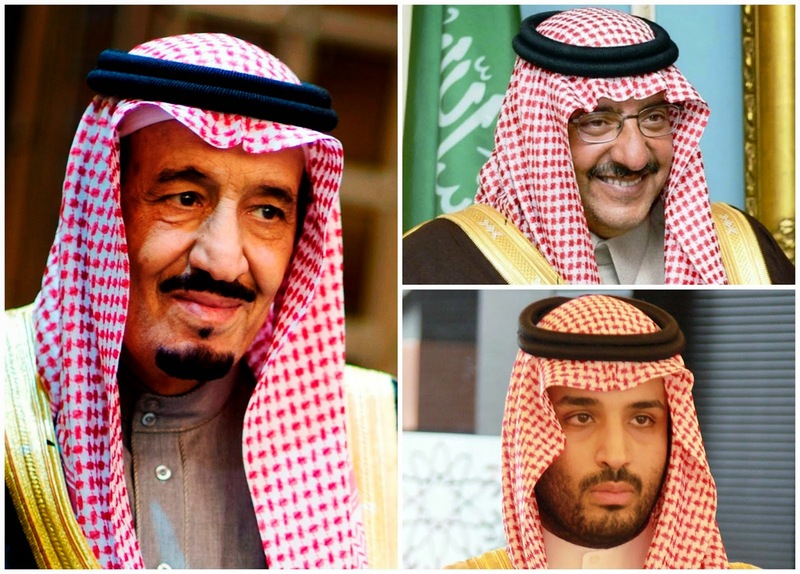 To recap those events in January: Upon the death of his half-brother King 'Abdullah, Crown Prince Salman bin 'Abd al-'Aziz Al Sa'ud became the king with no controversy - the Saudi succession has been remarkably smooth for decades. As expected, Salman named his younger brother Muqrin (one of the few surviving sons of the kingdom's founder) as the new crown prince. However, the new king surprised many "Saudi watchers" by removing King 'Abdullah's son Muta'ib from the recently created position of deputy crown prince and naming his full nephew Muhammad bin Nayif (age 55), the Minister of the Interior - the powerful internal security agency of the kingdom to fill the position. Muhammad bin Nayif is the son of Salman's full brother Nayif - one of the so-called "Sudayri Seven" brothers who are the sons of who many believe to be 'Abd al-'Aziz's favorite wife, Hasah bint Ahmad al-Sudayri. See my article dealing with this issue, Naming of new Saudi deputy crown prince - future crisis averted? (January 24, 2015). The seven brothers for years were a close-knit group who wielded great power in the running of the kingdom. Two of the brothers have become kings, two others were crown princes, and the others have held key ministerial and provincial governor's posts. King Salman made other appointments in January as well, including naming his son Muhammad bin Salman (age 30) as Minister of Defense and Aviation (MODA), one of the most powerful portfolios in the kingdom. With these moves, members of the al-Sudayri clan were once again the preeminent power brokers in the country. Fast forward to this week. In a royal decree, King Salman removed his brother Muqrin as crown prince and elevated Deputy Crown Prince Muhammad bin Nayif to the position of crown prince, in essence personally selecting (rather than via a family meeting) the new king from the grandsons of 'Abd al-'Aziz. If this succession occurs without incident when Salman dies (he is now 79), it will have solved the succession issue. It will also have maintained the superior position of the al-Sudayri clan. Read on, it gets better. In addition to elevating Crown Prince Muhammad bin Nayif, the king named the new deputy crown prince - his son Muhammad bin Salman (the powerful Minister of Defense and Aviation). - The King of course is the monarch. - The king's full nephew Muhammad bin Nayif is now the crown prince as well as the powerful Minister of the Interior. - The king's son Muhammad bin Salman is now deputy crown prince as well as the Minister of Defense and Aviation, controlling the armed forces and anything that flies, military or civilian - that same son is concurrently the secretary general of the royal court. The defense minister is quite popular in the kingdom at this time - the Saudi-led intervention in Yemen is widely supported. These three men, all al-Sudayris, in essence run the kingdom. The royal family has always run the kingdom, but now most of the power has been concentrated into one small faction of the royal family - the descendants of 'Abd al-'Aziz and his favorite wife Hasah bint Ahmad al-Sudayri. Yemen - do the Houthis want to talk?